For those about to begin repainting their kitchen space, it might seem as if making a choice on the color of the paint is impossible. There is now a never ending selection of paint colors available for homeowners taking on home improvement projects. With a little expert guidance, homeowners can select the ideal tone for their design needs. 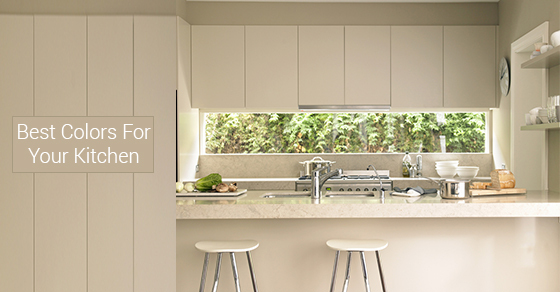 Within this post we’ll provide our expert guide on the best paint colors for your kitchen space. Many homeowners are now selecting warmer colors such as deep reds and blues within their kitchen areas. Scientists believe these colors could play a role in increasing our appetite and calming our mood, and these characteristics make them ideal for the kitchen space. Reds are especially popular as red is extremely versatile and can be used to make cabinets standout as well as brighten the surrounding walls of a kitchen space. For homeowners that have recently completed a large scale renovation of their kitchen, the goal might be to highlight their renovation work. In which case, they might consider the use of neutral tones such as greys and light yellows to bring more attention to the elements within the kitchen. Another benefit of neutral colors is they can be combined simply with any other color, and so this presents more options when upgrading furniture and other items within the kitchen space. Homeowners that are looking to add stylish and dramatic appeal to an older kitchen area might consider the use of darker blues within their home. It’s important to consider the impact that dark paint colors will have on the space, however. In smaller kitchens, dark blues can make the space seem uninviting. Used effectively, with the right light colored accents throughout the room, darker blues can add significant style value to the home. The use of yellow paints within home décor has been shown to offer a soothing feel within the environment. For a more relaxed kitchen area, a brighter yellow might offer the requisite appeal. Yellow is also the ideal option for smaller kitchen spaces, as it can open the room up and make those darker corners feel brighter and more welcoming. By reviewing the tips in this post, you can get a sense of the type of colors available for your home kitchen painting project. To learn more, contact our décor specialists today!